A fickle wifi connection, carelessly loud coffee shop patrons, and a table barely big enough to fit a laptop and an éclair. This is your life when you work remotely. At AppSumo, we pride ourselves on offering the best tools to run a successful business. And now, we are partnering with the good folks over at WeWork to give one lucky Sumo-ling the ideal workspace to get things done. 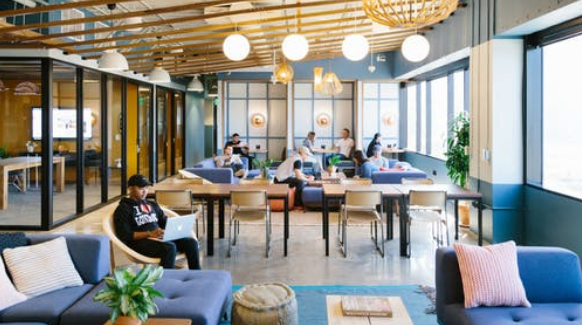 WeWork is a coworking environment geared for your productivity, innovation, and networking. Sumo-ling, if this is your first time hearing about WeWork, you’re in for a real treat. WeWork is full of entrepreneurs and hustlers just like you, checking things off their to-do lists and making friends (if they want to). Super-fast internet. Pick your poison (hard-wired or wifi) and get to surfin’. Free refreshments. Enjoy complimentary fresh fruit water, micro-roasted coffee, and tea. Or bring your own food/drinks and use available refrigerators and microwaves. Private phone booths. Take all your important video chats and phone calls (“yes, Mom, everyone here is being nice to me”) in comfortable soundproofed alcoves. Spacious, unique, and clean common areas. Your environment should inspire productivity not provide distractions. The winner of this giveaway will get 1 year (12 months, for you calendar lovers) of access to a Hot Desk at any WeWork location. A Hot Desk is a shared workspace in a common area — all you need to do is come in and set up shop at any available desk. And...the winner will also get $500 in AppSumo credits! What do you have to do to enter? Just enter your email in the giveaway page.